LMU physicists have characterized in detail the optical response of semiconducting tungsten diselenide bilayer crystals and explained their distinctive spectral signatures. 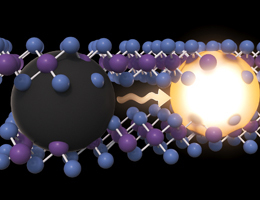 Reconstruction of the photoresponse of a thin-film tungsten diselenide bilayer. Source: C. Hohmann, Nanosystems Initiative Munich (NIM). Owing to their intriguing physical properties, ultrathin 2D materials have become a major focus of research in nanoscience. One of the most fascinating sub-group of these materials are the semiconducting transition metal dichalcogenides (TMDs), whose optical characteristics have the potential for novel technological applications. The mechanisms underlying their optical responses are, however, complex and puzzling. LMU physicists led by Professor Alexander Högele have now carried out a detailed investigation of atomically thin samples of the TMD tungsten diselenide (WSe2) with cryogenic optical spectroscopy. The results reveal the role of lattice vibrations in the photoluminescence of 2D WSe2 bilayers. The work is published in the online journal Nature Communications. Single and double layers of WSe2 differ in their fundamental semiconducting properties. While the optical band gap of monolayers is direct, it becomes indirect for bilayers. Therefore, bilayers show reduced photoluminescence when exposed to light with rich spectral signatures.